Day 99. One is a purple (jaam rong, to be accurate) Baluchari belonging to my Mami Madhumoni Dasgupta. The other is a magenta Benarasi, Ma Jhulan Bhattacharya​ ‘s wedding sari. When you are nearing 100, it’s gotta be something really really special and these two saris definitely qualify for that, each in its own way. I have to confess that I wore each of the saris barely for a few minutes, just for the post. But to make up for the breach, I have two saris at No. 99, instead of one. This story begins with a wedding (and ends with one too). In fact, this story is all about weddings. The Baluchari was a part of my Mami’s trusseau, a gift from her father. It was bought from Ananda (an iconic sari store), I am told. I am not too fond of, and on this I take after my mother, human figures in clothing. Perhaps that is why my mother has never owned a Baluchari as human figures are an essential element of it. Baluchari motifs usually narrate stories from the Ramayana. This is perhaps the only Baluchari I have seen where the human figures have been kept to the minimum, only in the pallu. The sari has exquisite ornamental designs all over. I have often looked for this kind of a Baluchari but never come across another one. I was in college when I wore this sari the first time, to a wedding presumably. But surprisingly I don’t remember the occasion at all. Ever since Mami requested me to wear this sari for the pact because it really is a sari that deserves to be showcased, I have been racking my brains to remember, only to draw a blank. Even when Ma fished out photographs of me wearing the sari back then, I failed to recollect. But what I do remember is that my Mami wore this sari at my cousin’s wedding reception in Mumbai. I had worn a maroon and green Pochampally that day. Ma had bought it for me specially for the occasion and she herself wore a flame and green Bomkai that she had bought for herself with money she had saved from tuitions. I had almost missed the wedding. First, because the dates fell right in the middle of my exams. But thanks to a generous gift, Ma and I managed to fly down to attend the reception. But even that was rather eventful, the flight having been delayed by several hours because of a strike. We finally reached well after midnight, and the reception was held the same evening. From one wedding to another, flashback to two decades earlier. My mother’s wedding. The magenta Benarasi was bought from Indian Silk House. The zari work is exquisite, with three different kinds of butis all over and an intricate border and pallu. Even after almost 40 years, the zari hasn’t lost its sheen. Ma wore it only a couple of times after her wedding though. But thankfully, this and the Benarasi she wore at her reception both survived a theft that happened a few years after her wedding. She lost most of her wedding saris but these two remained. For many years after that, they lay gently wrapped in soft cloth in her wardrobe. It was on the occasion of another of my cousin’s wedding that she took them out so that I could wear them. But I wanted a new sari for myself and it was decided that I would wear one of her Benarasis at the wedding and Ma would buy me a new one for the reception. She bought me a green silk, which I wore on several occasions till it started tearing and I made a dupatta out of it. But the first time I wore it remains memorable not only because it was my cousin’s wedding reception but also because it was the first and only wedding I turned up at without earrings and almost in tears! I was a little late dressing up that day (not really my fault as I had gone with tottwo, gifts for the bride and her in-laws, at her new home and got delayed). Rushed by everyone, I got into the car with the earrings in my hand. I planned to wear them once seated. They were gold jhumkas, studded with navratna, and originally belonged to my mother’s mother. Precious indeed. As luck would have it, the ‘push’ of one of the earrings slipped from my hand and fell. We searched the car but the tiny piece was nowhere to be found. My mother, grandmother and aunt were, of course, all furious at my carelessness. But my greatest punishment was that here I was at the reception, without any earrings to wear. I had tied my hair into a top knot that evening and the empty earlobes were all the more visible. I barely managed a smile on reaching, sitting in one corner, fighting back tears. No amount of cheering up by the others worked. And then a cousin came to my rescue. She had double piercing in her ears and took out the studs for me to wear. I managed a wan smile. Piali​di, do you remember? 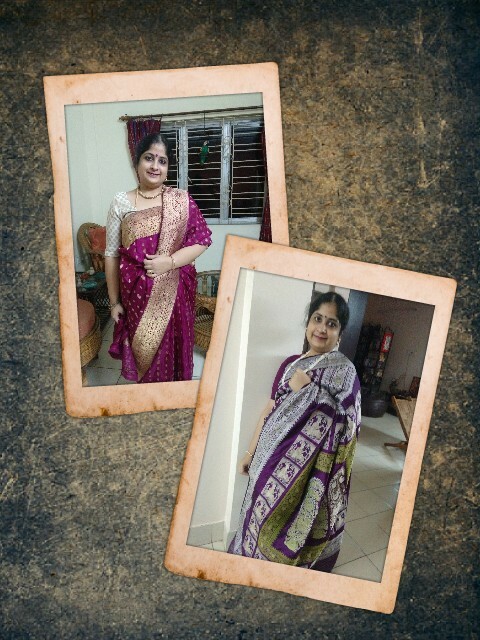 For the wedding, couple of days earlier, I had chosen Ma’s reception sari, mustard with large coin-sized zari butis and a purple border, because it was much lighter. It was a family wedding and would involve some amount of running around, hence the choice. I could wear the magenta one, which was surely more grand, some other time. Little did we know that it was not to be. My cousin’s Dday arrived and, in the morning, I wore a cream and red mekhala-chadar that Ma had bought me and which, I many years later, turned into a kurta. In the evening, I wore the Benarasi seedha-palla. But soon after, disaster struck. First stealthily and then full-on! As I walked around, I could feel the sari giving way. It was just ripping apart. I thanked God I was wearing it seedha-palla as that helped cover the inner tears. I kept praying that I could survive the evening because I didn’t have an alternative handy. The wedding was being held at a hired venue, away from our house, and if I was forced to take off the sari, I would have no choice but to slip into something ordinary. Somehow I managed to avoid that. Through the evening, I heard as many words of concern and caution as compliments. At night, when I took off the sari, it had been reduced to strips of cloth. My mother’s heart, I am sure, tore a bit and for her mine. The pallu and border survive and I plan to get them stitched onto a sari some day. But that very moment, I decided I would never wear her wedding sari. It would be much wiser to let it lie in the almirah, like a loving memory, rather than risk ripping it apart. So it had been for all these years till a few days ago, I had this desire to drape it just once and tell its story in the pact. As I gingerly draped the sari in the evening, it was already torn in places and seemed to have turned brittle like paper. With great difficulty I managed to hide all the gaping holes somewhat and I must thank for making them vanish in the photographs she took. And what a coincidence it was when the day I had chosen to wear it, I saw Ally post a picture of herself in her mother’s wedding Benarasi that morning. And that too in the same colour. It seemed that I had come a full circle. We are the #100sareefamily, as Ally says. 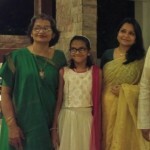 Wearing the yellow saree that i wore on my wedding … for my cousin’s wedding.